Mexican government making it hard for immigrants living abroad to vote by mail. During the last few weeks, caravans of Mexican immigrants living legally in the United States have been traveling to Tijuana and other border cities to apply for a Mexican voter identification card (credencial de elector), in some cases escorted by organizations hoping to get them to vote in Mexico’s upcoming presidential election. A voter registration card is required to vote in Mexico, and by law, can only be issued on Mexican soil by the Federal Electoral Institute (IFE), an autonomous, public organization that conducts federal elections. Without it, those living outside the country cannot cast an absentee ballot by mail. The deadline to register to vote by mail is Sunday, Jan. 15. The deadline does not apply to Mexican nationals who want to return to the country to vote. Martin Lopez, a Mexican activist in Los Angeles, has been helping fellow Mexicans register to vote through the online IFE’s website www.VotoExtranjero.mx for the upcoming 2012 Mexican Presidential Election. Ten days ago, 10 people helped by local organizations made the trip from Los Angeles, across the border and back, and 8 more people are scheduled to make the trip today, Lopez told EGP late last week. Felipe Sanchez, a Mexican immigrant who doesn’t identify himself as an activist, has also been helping Mexican voters who can legally cross the border to register to vote. “There are a lot of stories … we’ve had elderly voters come in who bring their voter identification card that pictures them when they were 18 years old, there’s a huge difference in their appearance,” Sanchez said. Numerous local organizations—like Vamos Unidos USA, The Full Rights for Immigrants Coalition, Hermandad Mexicana Nacional, Federacion de Clubes and Organizaciones de Zacatecanos, and MORENA—have been laboring to get out the Mexican vote, he said. Few Mexican immigrants who reside in the U.S. will actually cross the border to vote, says Juan José Gutiérrez of the Full Rights for Immigrants Coalition and Vamos Unidos USA. Those that do will do it for symbolic reasons, not because it’s more convenient, he says. Gutiérrez and other activists allege that Mexico’s voter identification requirement disenfranchises a majority of Mexican citizens living abroad who are eligible to vote, but cannot return to the country either because of their legal status or the cost to make the trip. To obtain a voter identification card, a Mexican citizen must present required documents to an IFE office in Mexico. There is a minimum two week waiting period for the card to be approved and issued. For Mexicans legally residing in an area of the U.S. but not near the border, the cost of buying an airplane ticket, missing work and financing expenses for up to six weeks while waiting for the card to be issued is not affordable, says Gutiérrez. “Although Mexican authorities can brag about how much they’ve advanced in democratic process in so far as Mexicans voting abroad, much work remains to be done because democratic rights are not fully extended by the Mexican government to Mexicans voting abroad,” Gutiérrez told EGP. The result is the systematic denial of the right to vote of the majority of the voting age population living outside the country, Gutierrez said. “Seventy percent are effectively barred from voting … only those who have US visas or US citizenship and live near the US-Mexico border, and are willing to go to an IFE office and jump through all the hoops [can obtain a voter identification card to vote by mail], he said. Since 1917, the Mexican Constitution has guaranteed the right to vote to all Mexicans, including those living abroad, so the current electoral system is unconstitutional, Gutiérrez insists. “As far as I’m concerned, every single Mexican election that has happened is illegitimate because it has excluded a significant voting-age population abroad, especially in the US,” he said. IFE officials estimate that in California, about 5,000 Mexicans citizens and individuals with dual US/Mexican citizenship have already registered to vote by mail. The majority are likely from the Los Angeles area, as was the case in 2006 when 12,000 votes originated from the L.A. area, according to IFE Electoral Adviser Francisco Javier Guerrero Aguirre and IFE Mexican Voter Abroad Coordinator Dalia Moreno. Mexican voters living outside the country that successfully registered to vote will receive their ballots by mail starting in April. It must be received by IFE by June 30—one day before the election. 2006 was the last Mexican presidential election and the first time the Mexican government, through IFE, enabled Mexicans outside the country to vote. Fifty thousand registered to vote from abroad, but only about 32,000 submitted a ballot, said Guerrero Aguirre. IFE was created 21 years ago after Mexicans on both sides of the border pushed to reform Mexico’s electoral process by making it more transparent. Mexico elects a president every six years. A number of activists allege thousands of votes were disqualified in 2006, changing the outcome of the presidential election, which they say would have been won by Andrés Manuel López Obrador. Others say Felipe Calderón was rightfully elected. While IFE acknowledges that the current vote by mail process is too restrictive for undocumented and documented Mexicans living in the US and other counties, only Mexico’s Congress can change the requirements, Guerrero Aguirre told EGP. IFE sees two possible ways to address the problem: find a mechanism to issue voter ID cards outside of Mexico, and allow in-person voting at specified locations. The change would have to be adopted by Mexico’s Congress, which appears unwilling to support outreach to expand the number of Mexican voting from abroad. IFE’s vote abroad outreach budget was slashed about 60 percent by Congress, notes Moreno. Nonetheless, they have done “more with less,” carrying out two positive “innovations,” she said. In 2006, using an absentee ballot cost $8 to $12 for priority postage; this year there is no charge. And for several months, IFE employees have staffed help desks at consulate offices that serve large Mexican populations, like in Los Angeles. The changes resulted from recommendations made following the 2006 election, Moreno said. IFE has also enlisted 60 local organizations to disseminate information, she added. IFE’s budget was cut because of the lower than expected turn-out of voters living abroad in 2006 didn’t justify the cost of the previous campaign, according to California State University, Los Angeles Assistant Professor Emily Acevedo, Ph.D.
She says the voter identification card is one of the strong points in Mexico’s electoral system, and that it helps prevent election fraud. Besides having a photo of the voter, the card also has the person’s thumbprint. While stricter voting identification requirements in the US are being debated, the identification requirement for US citizens who desire to register to vote from abroad vary from state to state, according to Kate Meadows of the Federal Voting Assistance Program. Although US citizens cannot vote in person at locations outside the US, they can vote using the absentee voting process, she said. “While some states do not require ID with a Federal Post Card Application (FPCA) other States accept State Drivers license or State ID number – or require the voter’s full Social Security number,” Meadows said in an email. Voter apathy, however, is a serious problem in the US as it is for Mexicans living abroad. For Mexicans in the US, who are not recent immigrants, the apathy could be due to them no longer having strong ties to Mexico, or plans for returning. They may not feel like they have a stake in the safety and viability of Mexico’s government, Acevedo said. Voter disillusionment with the Mexican government is also an issue. Many immigrants believe the government is corrupt, in some places undistinguishable from organized crime. So they take a “why bother voting” attitude, some activists say. It is unclear how many potential Mexican voters are living outside the country, but IFE estimates 2 to 3 million in the US could be eligible for a voter identification card. Guerrero Aguirre points out a double phenomenon: There are Mexicans who don’t vote in the US and who don’t vote in Mexico, that’s really the worse thing that could happen to any citizen, he said. 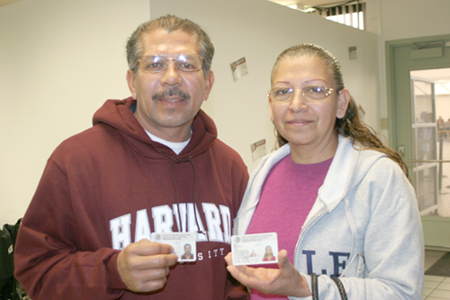 January 12, 2012 Copyright © 2012 Eastern Group Publications, Inc.
Mexican immigrants must have voter I.D. cards to vote in Mexico? Can these Mexicans also vote in the U.S. election? How would we know? The DOJ challenges any State that requires voter I.D! But it is OK for Mexico?